While Facebook yesterday revealed that its advertising sales increased 45 percent year over year to $4.3 billion in the third quarter, it would still like to gain a bigger share of local business marketing budgets. The Menlo Park, Calif.-based tech giant today announced it's debuting two ad products for local businesses aimed at helping them better understand the foot traffic in their area while also allowing those with many locations to target ads for specific stores. For starters, the company is launching a new tab in Page Insights to help businesses better understand the groups of people near their store. Looking at aggregate demographics and local trends, businesses can see—because Facebook's mobile app users often their their location be known—when their neighborhood is busiest. A Facebook rep said that retailers can view how many anonymous Facebook users were within 150 feet, 450 feet and 1,500 feet of their stores. They'll also be able to see aggregate demographics, such as age and gender, for people nearby, along with whether someone is a resident or a visitor. The social network hopes the ability to understand a neighborhood will help businesses feel better about whether their ads are hitting people near their stores. "Now, for the first time, advertisers can see the percentage of people nearby who have seen their ad, helping them understand how well their ads are reaching their potential customers," according to a blog post announcing the news. "Over time, this new metric can also help advertisers draw a connection between reaching a larger percentage of people nearby and accomplishing the business outcomes they care about." Targeting local traffic dovetails with another new product. 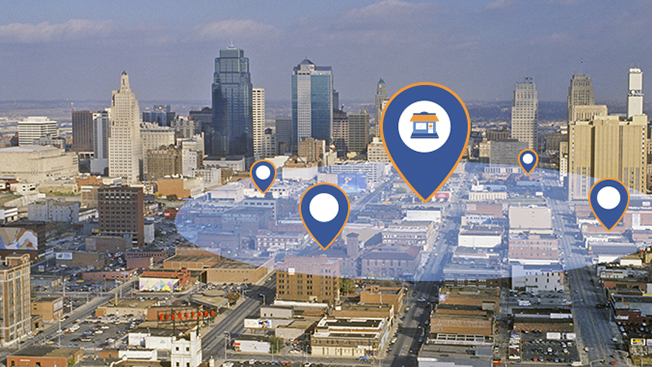 In a follow-up to last year's launch of local awareness ads, Facebook will create location-specific ads for businesses with multiple stores. Facebook said this feature should help simplify ad targeting, allowing businesses to select which stores they want to run ads for. People nearest to a given store or restaurant will be able to see that branch's name and address, along with a call-to-action button that provides local directions or a phone number. Restaurants, as one example, with a handful of locations in a city will likely find the promos worth testing. "These [products] are both ways for businesses with the insights product to understand the state of foot traffic around their [stores] and give them an opportunity to see how their ad campaigns affect that foot traffic," Matt Idema, vp of monetization product marketing at Facebook, told Adweek. "In addition to the ads being locally relevant, the way that the ads get delivered to people in the system will also be delivered locally," Idema said.